save feature doesn't even work. fix the bugs! This app is awesome, only thing that gets on my last nerve is it continues to crash! Please fix this issue! When you try to send email, it doesn’t send. If people don’t put phone number, there is no way to communicate. App itself is good, but it’s missing filtering/ordering by MSRP. The only other issue is consistent crashes after about 5-10 minutes of searching/viewing cars - this has been going on for over a year. This is the only app that makes my phone hot to the touch and the app force closes after about 20-30 min of use. App used to work great. Simple to use and always worked well. Now it always crashes. If it ain’t broke don’t fix it. The app is easy to use but it crashed all the time. Hope they will fix the issue. 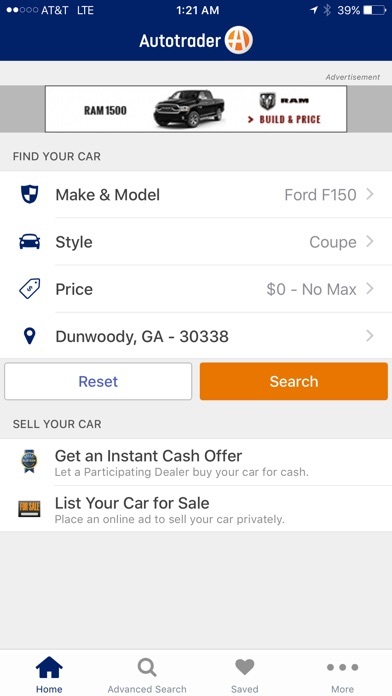 My favorite car search service and app, but can’t save vehicles. Keep getting an “Oops we stalled. Please try again” error. Please fix!!! I like the convenience of the app, but get frustrated that I load all the filters, then try & “save” the search & get an error message. It simply states Error Oops, We stalled. Please try again. This has been going on for weeks. New update more clumsy less informative and crashes constantly. Overall presentation and ease of use is great. I love the software and the efficiency of the app, except one thing. It crashes every time I use it. I mean if I use it 5 times a day to research on a car, it would crash more than half the time. It needs to be updated and worked on. Other than that, everything is great. Please update the software! Only responses are from scammers. Everything what you need with some room for improvement. When you want to have more than one trim selected you have to add the same car multiple times, just with different trims. No major thing but multi select would just make it easier. It should be possible to sort the the saved cars. It should be possible to change a saved search instead of having to save a changed search, name it again and delete the first one. Maybe I’ve overlooked how it works, then the user interface could need some improvement. Apart from that thumps up. And you will find almost all available cars on it, it seems. App used to work great but this latest update has been crashing every single time I try to use it. Your app is freezing up again take several tries for it finally works. I only rated this one star because I keep getting bothered to rate it. Otherwise I like it a lot. This app clearly doesn’t work for private sellers. I have tried 15+ times to contact private sellers and i believe my emails are not being sent. 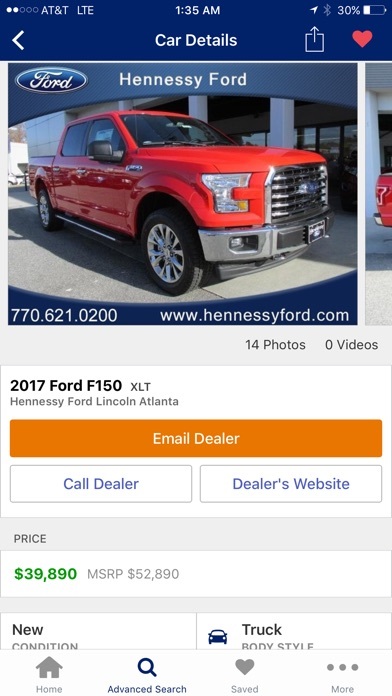 I have had zero responses to questions and outright offers on vehicles. Competitors like cars dot com or car gurus have responded immediately. I suspect a sham. If you are a private seller or someone who only wants to shop fro. Private sellers, i suggest using another app. Some of the searches I created on my laptop do not work in the app. Always returns 0 results. What happened to being able to select trim? Finds exactly what I’m looking for! Easy to navigate and get the hang of the only problem is it keeps closing on its own after I scroll down a few times, it’s quite annoying. Other than that great app. All of a sudden, I am unable to save vehicles. I keep getting the “oops we stalled” message and then the app crashes unexpectedly after 5 minutes. Please fix! Loses saved vehicles and searches all the time for no reason. Doesn’t need updated, just loses them. 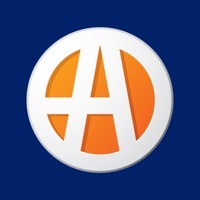 Also not many dealers use Autotrader in many areas so many many vehicles that are for sale are not on Autotrader. This app continues to delete your “saved cars”. 50 cars saved. The next day all 50 disappear. “No cars saved”???? Don’t waste your time! Had been working for years for me. But recently out of the blue my husbands app glitcged where he couldn't save cars anymore. And then just yesterday mine started glitching to me too. So I logged off and now can't sign in, keeps coming up with an error code. Very frustrating. I've rest set my phone un-installed the app. 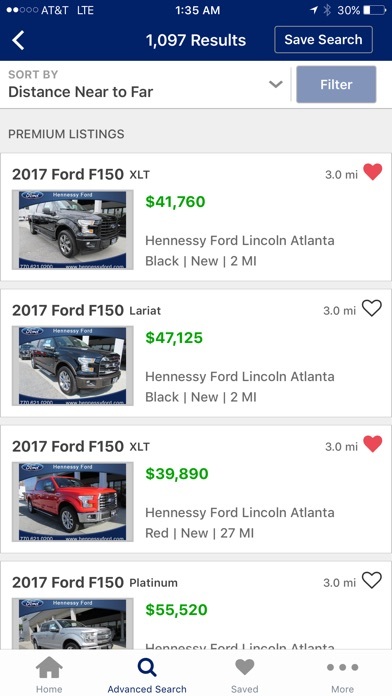 We are both at a loss and currently in the market for a car and can't save our car searches. Great app but utterly useless thanks to a couple bugs I noticed after 10 minutes of using. It wouldnt search using zip code until I shared my current location, very annoying especially since I wasn’t looking for cars in my current area so why would I need that enabled. Then I finally want to bookmark some results and it requires me to login but jokes on me because the in-app sign up and mobile website are simply broken. Tried two different emails and got nowhere. Waste of my time, thanks autotrader! Cannot save searches or the selected cars, have to start over again everyone! 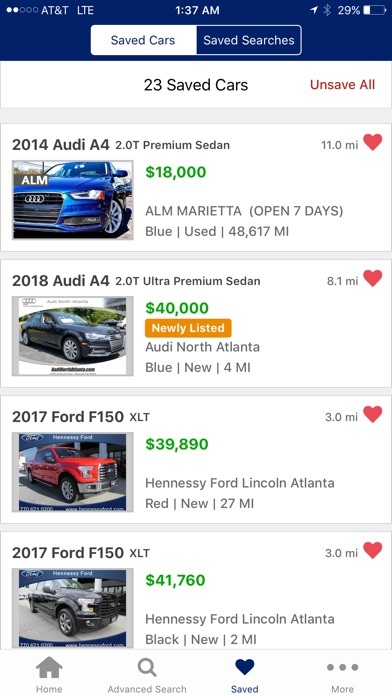 The Autotrader app is very easy to use and I can find the car I want quickly. Something happened. 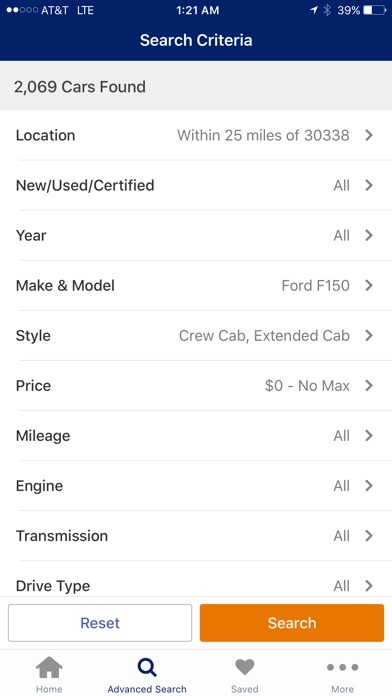 Searches and cars can no longer be saved with Apple App. Near to Far filter is not accurate. I can’t understand why Auto Trader can’t fix this app. I have been using it for years and it has always been glitchy. It crashes almost every time I use it for more than 5 minutes at a time. And why in God’s green earth would you remove the car fax button??? Who buys a car without checking the car fax? App crashes a lot with iPhone. I also wish it stayed where I was longer when I switch between apps. I’ve tried this app and it is so glitchy and absolutely no cars show up for any model and type. Overrated. Especially lately - it’s been crashing every time I use it on my iPhone 8plus. Too bad - it’s a pretty good app but it’s unreliable.